I am a self-employed Legal document writer (similar to Property Solicitor) applied from India along with 2 dependants - my wife (unemployed) and son (5 years old). My Sister and brother-in-law living in London are sponsoring our travel and accommodations for 2 months of our visit. I do not have a business registered/business bank account. But I maintain a separate current account (for business activities) and personal savings account. Due to the nature of business (soliciting/documenting land/property transactions in India), I mostly get my fees and Government registration costs paid by cash. I normally deposit only the registration costs (expense) as cash in my current account and pay to the government accounts and handle my fees/commissions (profits) as cash, which is not accounted in the current accounts. Although there are many cash deposits (at least one per day) and multiple online payments to Government bank account for registration charges, there is no evidence of taking salary/dividends. I have submitted Income tax returns for the past 3 years for a gross income of 4-5 Lakh rupees (~5000 pounds) per year. I have also misunderstood the question about my annual earnings which I mentioned my income before tax, while the caseworker checked the income after tax. Can I reapply with the same supporting documents (current and personal statements), and explaining the nature of my business is mostly cash transactions? How should I explain my cash transactions and lack of evidence (in bank statements) for salary/dividends (although the tax returns show these as income)? Will a letter from my accountant and the business bank detailing my profession and finance help? Appreciate your response and thanks in advance. There are not clear transfers between your business and your personal accounts. Your business accounts are probably complex and would require a great deal of effort from the visa officer to determine if the business is as profitable as you say it is. The final issue is that there seems to some confusion between gross income and net income. That is probably resolveable though. The issue of the amount of effort involved to understand your business accounts is a real one. The visa officer will simply not have the time to process detailed and complex accounts, and if they cannot find the information they need in the time available they will deny your visa. It is your responsibility to demonstrate to the visa officer that your financial situation is what you say it is. I will frankly admit I have no idea how to address your problem. However this is the sort of thing that the visa officer wants to see. Providing this will make it easy for them to grant you a visa. They want to see a statement of your own personal monetary situation, separated from your business. Only then can they tell what your actual personal income is (as opposed to your business income). They want to see regular transfers from your business account to your personal account. These should match the amount you have claimed for yourself as income. It certainly doesn't help that you have money that never passes through any of your accounts. Getting money in cash is OK, but that can't be used as evidence of your income. You might consider in the future depositing all your cash payments into your bank account, and making payment for your business expenses from your account instead of in cash. However if you can show a personal account with regular transfers from your business coming into it, and a business account that shows those transfers coming out, they may not be interested in the details of your business. You might consider getting a qualified professional bookkeeper to do your business accounts, and have them make an official (notarized?) statement of your business' profit. I don't really know how well that would work. Our member-on-sabbatical, Gayot Fow, has dealt with this question on his blog. At his invitation and for the benefit of the OP, I repost the body of his answer here. in many cases, needing a sponsor actually increases the onus on the applicant to demonstrate that they qualify. To be sure, one can read through the archives and find dozens of refusals where the use of a co-sponsor did not decrease the risk in a given application. The OP operates a sole-proprietorship, much of which is cash-based and none of the submitted evidence appears to support the OP’s claims to solvency and income. Another interesting aspect of cash-based income is that the skill on offer satisfies a need that occurs everywhere and already exists in plentiful supply in the UK ‘black economy’ and when UKVI is seen as fuelling the ‘black economy’ by adding more resources, social protests can (and frequently do) take place. So as a result, UKVI needs to be especially cautious when an applicant fits this type of profile. When I use the word “premise“, it takes on a special meaning, specifically that which forms the basis for a visa application at this particular point in time. Is it part of a regular visiting scheme? Is it a family application where visits are alternated between the home country and the UK? Does the proposed host have a historically strong relationship where a visit is appropriate right now? Does the proposed host have a great history sponsoring other applicants? Has the host previously visited the applicant in their home country? In the case at hand, it can be inferred (from the absence of text in the refusal notice) that the OP failed to provide a solid premise. This is almost always a show-stopper in its own right. 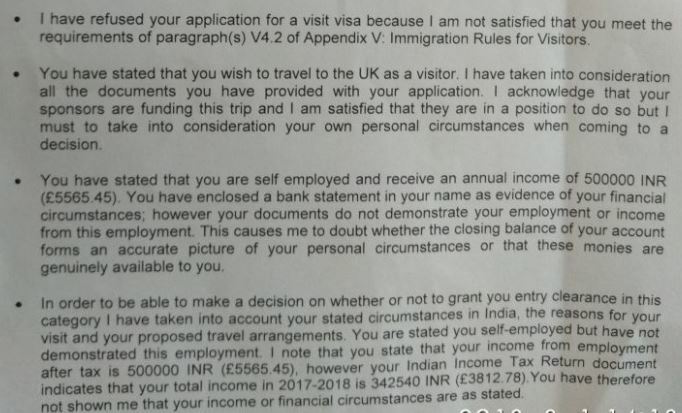 Another noteworthy canonical case of a failed premise is often found in the visit application where the premise is a blossoming internet relationship however the applicant is invariably unemployed, has no immediate career prospects, living with their parents, or otherwise totally ‘ without anchors’ to their home country. In that case a premise may be offered along the lines of ‘…we want to see each other in person…’ and we already know that ECO’s do not find this to be a viable premise. So in the American parlance, the OP is ‘three strikes and you’re out’. The rough UK equivalent might be ‘done and dusted’ or ‘that’s it and all about it’. I am not a cricket fan, but if you have a great equivalent drawn from cricket, do leave a comment. 1.Can I reapply with the same supporting documents (current and personal statements), and explaining the nature of my business is mostly cash transactions? 2.How should I explain my cash transactions and lack of evidence (in bank statements) for salary/dividends (although the tax returns show these as income)? Will a letter from my accountant and the business bank detailing my profession and finance help? Both of these questions are fundamentally opinion-based, as not even recognised experts in the field will agree on a single approach. TSE, at least theoretically, eschews opinion polls, however, and inexplicably, they have agreed a generous bounty on this one. Think about it… You have given a long-winded list of dot-points about the peculiarities of being a property solicitor, but who knows stuff like that on TSE? How are they supposed to know if your explanations are worthy or not? So essentially your question is ‘off-topic, opinion-based’ or ‘unclear’. But aside from that, let’s take the questions head on by offering my own opinions. For question 1, anybody can make an application anytime they want regardless of their history (and as long as they pay the fee, have a passport photo, etc etc). You can explain all you want, but the issues from their side will be ‘…how come other property solicitors are able to operate their business without being cash-based?…‘ and ‘…you gave us stuff where the numbers do not tie out, how does this demonstrate your competence at operating a sole-proprietor in the first instance? What is an explanation supposed to prove?…‘ In other words, it’s doubtful that you know what your income is or are otherwise unable to provide a consistent number. An explanation, unless crafted by an expert, is more likely to make matters worse (with a prior refusal, and now marked as someone they do not fully trust, your explanation will introduce inconsistencies and invite refusals based on the discrepancy method). For question 2, it looks like you have not been operating your sole-proprietorship in a way that anticipates making a UK visa application. Introducing another party, such as an accountant, at this stage is less likely to help because they were not introduced at the initial stage. Why not? Anyway, the accountant’s credibility will become an issue it’s unclear what they could do to sort out statements given in your first application and how they would go about verifying the information. But of course if the accountant has an established practice area and a known reputation, it can be helpful (in the absence of anything else). Or alternatively, you could have a known expert in property law explain that the way you are running your business is the norm. But even so, it will be an awkward task to explain why the numbers do not tie out when they are supposed to tie out. And so the answer is (IMHO) to start running your business in a way that anticipates the transparency and consistency needed to make successful visa applications. Then after a year or so, make a fresh application. Also, having your sister in the UK arrange a consultation with a regulated adviser can be of enormous help. I have no problems at all if she shows him this article to clarify portions of it. Or to agree with it or discredit it or to nit-pick on it or whatever. It’s all good. Anybody else is similarly invited to use this answer for whatever purposes they want. I do not recommend making a fresh application in the near-term (even though you are entitled to make one) because it invites the tailspin of serial refusals. Also, serial refusals get a lot more expensive for a solicitor to unsnarl. Moreover, when a solicitor starts seeing the discrepancy method being used, they are more likely to start asking if you have made a full disclosure to them and liable to up their fee anyway.